A Life of Sugar and Spice: Beef. It's what's for dinner! Recently I received a package from Rocky Mountain Organic Meats that are 100% gluten free to sample. I was overwhelmed with all the options. Jerky, ground beef, sausage, hot dogs and pastrami. Ooooh Pastrami!! I haven't had this since pre-gf days because the only way to eat pastrami is on a soft yummy roll. Well since I discovered Schar sub rolls I knew exactly what to do. This pastrami is thicker than I'm used to, I'm used to the shredded, fatty kind that you find at the deli in the grocery store. This is thick and the edges have a nice crust of seasoning. I wasn't even sure how to cook this so I went with what I know and put it in a pot of water for a few. 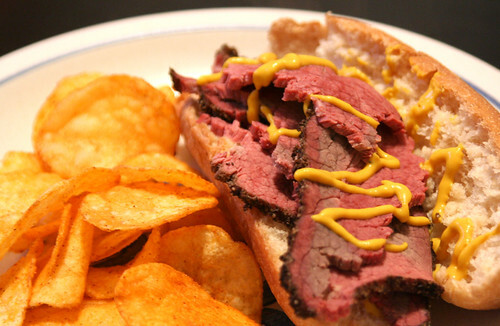 I kept it simple with the roll and yellow mustard, some BBQ Kettle Chips on the side. This was so delicious!! I also sampled a little of the jerky which was great too. I will definitely have more Rocky Mountain Organic Meats reviews coming up. Right now the ground beef is defrosting, but I can't decide if I want to do a burger or meatballs. I might do both. I really want to showcase the meat so a burger would be a great way to do this. But I've also been craving a meatball sub... we shall see!! Why do your posts always make me crave whatever you're blogging about?? You have the magic!